This week the DC Zoning Commission had its first review of the planned DC United stadium at Buzzard Point. The commission unanimously agreed to send the planned-unit development application to a future public hearing, but not before running down a list of concerns and questions it wants answered in advance. These include bicycle and parking facilities, acoustic analysis for concerts and, most importantly, improvement of the overall design. 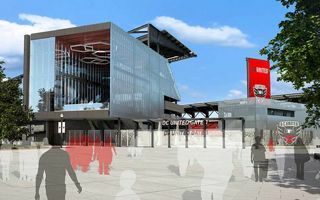 Just as many DC United fans saw this latest concept as an upset after previous one from 2014, also the commissioners have their reservations. "The design itself needs a little more maturity," Commissioner Peter May said. "I appreciate the industrial aesthetic. But in some areas there are views, particularly along the street facade, where you're looking at the underbelly of a stadium. It's not necessarily a celebration of structure. It is just, sort of, well this is the underside of the stadium." The application needs to be approved fast if the building is to be opened in time for the 2018 MLS season.